When you're talking about a balanced PC build, it's tough to look past this machine from PC Specialist. It really has got the lot, and it's difficult to see where any real compromise or sacrifice has been made. Pretty much all the other machines here have dropped something, or opted for cheaper versions in order to push more performance elsewhere, but there's precious little evidence of that in the Vanquish Eclipse. Core i5-3570K with a decent overclock? Check. Quality graphics card? Check. Copious amounts of RAM? Check. Decent capacity solid state drive? Check. 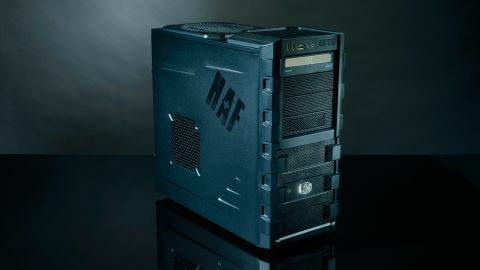 See, everything you could want in a £1,000 gaming machine - it's even all enclosed in the Cooler Master HAF chassis. There was a time not so long ago when pretty much every gaming PC that came through our labs was housed in one of those. So what's the problem with this machine then? There must be one, right? Well, no, not really. We're tempted to say that the 16GB of RAM is a little overkill and the Blu-ray drive is almost a complete waste of cash in a home PC that's not sat under a HDTV, but that would mean complaining about things you seem to be getting as extras. We'd rather have a higher capacity SSD, but we doubt shipping off the extraneous ODD and halving the RAM count would free up enough cash to spend on a 240/256GB solid state drive. It would be churlish to complain, then. All that extra memory doesn't translate into more bandwidth, though. The HyperX RAM in the PC Specialist machine comes fairly close to the bottom of the SiSoft Sandra memory bandwidth test. That said, the differences are slight, and higher capacity is probably of more worth to us users than an extra fraction of a GB/s. The combination of SSD OS drive and the huge amount of RAM on offer mean that this is a thoroughly responsive machine. At 120GB that SSD isn't huge, but you'll get a good few of your favourite games on it. That will make as much difference to your overall experience as the lightning-quick boot time - the second fastest in our test. The CPU is clocked at a good, solid 4.6GHz, which puts it right up there with the best of the i5 brigade. In terms of straight quad-core processing then, the Vanquish Eclipse is on top of its game. The choice of the GTX 670 as its graphics processor is an excellent one; though it's only a stock-clocked card it still has some fantastic gaming chops. Once again, it loses out in-game to the speedier HD 7970 and GTX 680, but it can definitely hold its head up high, exceeding 30fps in both DiRT Showdown and Metro 2033 at 1080p top settings. The Vanquish Eclipse then is one of the brightest rigs we've got in this test. It certainly doesn't sit astride the benchmark tables like some computing goliath, but nor does it have any glaring failings or omissions. It just goes to show what a smart outfit PC Specialist is when comes to specs.